This is a cross post from the Tandem forum. However, I figure there are a lot more people here that have experience time trialing, and its a more active forum, so I'd like the benefit of your thoughts as well. We're going to do a couple of time trials on the tandem for the first time this year; the State TT championship in May, and the Co-Motion Classic Tandem Race has a stage that's a time trial. So are there things unique to Tandems that we should consider with regard to preperation, equipment, training? With regard to equipment, we'll use clip on aero bars for the captain. For the stoker, I'm thinking we'll just go with the bullhorns that are already on the bike, perhaps lowered. Although I'm interested in the "drop in" bars pictured below. I also thought about building up a Zipp 808 clydesdale rim with a Tandem hub. However, Zipp strongly recommends against this on the basis that the wider spacing results in the spokes pulling at an angle that will crack the rim. Also, I'm too cheap to spend the money for a couple of events. Time Trial helmets. Data suggests that a TT helmet is one of the biggest energy savers you can buy. I already have one, but my stoker doesn't. Any thoughts on how important a TT helmet is for the stoker. Last edited by merlinextraligh; 02-12-09 at 10:33 AM. yeah, and edit your post to half it's size. I thought I was having Deja Vu. Then I realized I was. I thought I noticed something like that too, but marked it up to my own insanity. problem with cutting and pasting. Oops. 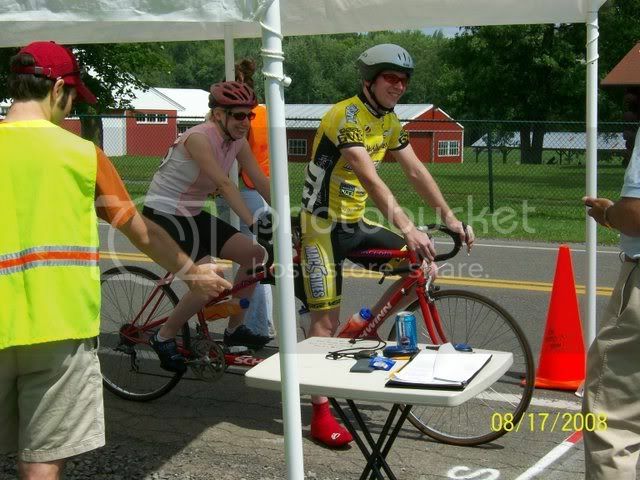 Here's my wife and I getting ready to start the NYS TT Championships. It was the longest ride she had ever done, and her first race. It was more for fun, since I had already ridden in the Cat 4 TT, and my legs were totally shot. I was a little worried when she started complaining on the first hill, but she made it, and was pushing hard all the way through the finish. It was a lot of fun, and she said she'll do it again this year. ^ Thanks or the link. I was surprised by a couple of things. One, the relatively low cadence. I wonder what the cadence of each of the riders would typically be for an individual TT, i.e. 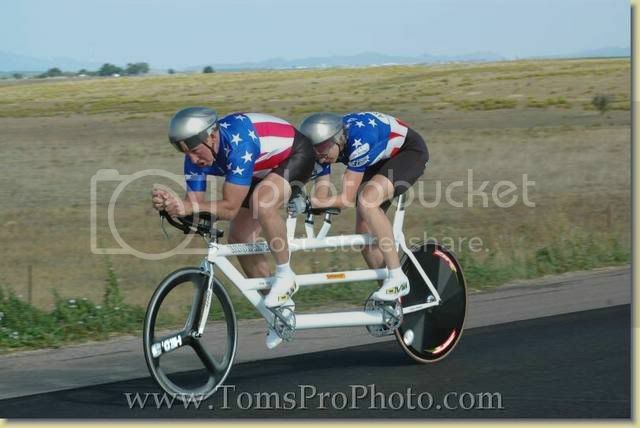 did they ride a slightly lower cadence on the Tandem. Two, I would have guessed the watts to be higher. Merlin, why don't you just talk to Jim W, he lives right next to you and has numerous attempts at tandem TT'ing, including his national championship. I have. They did it the old fashioned way, with a lot of power, and not much in the way of high tech. I believe they just used clip on aero bars, and the Rolf Prima wheels which we ride as our regular wheels. When he rides his tandem with Katie on group rides, they absolutely fly.